Holyyyyyyy warm tones! BH Cosmetics is launching their NEW Studio Pro: Ultimate Neutrals 42 Color Palette on Monday, 12.11! The palette will launch during their Green Day sale and will have a special launch price of $17.99 (regularly it will retail for $22.99 so that’s a solid $5 in savings)! We totally love the BH hooks us up with a special promo price for new releases! We are never made about saving some coins. We’ve written about the Studio Pro palettes before (peep out post about the Ultimate Artistry Eyeshadow Palette) This palette features a clearly super warm mix of lighter shades and deep shades in shimmer and matte finishes! We are totally all about the vibes in this palette! Those swatches of the shimmer shades have got us SHOOK! But we have to be real – we’ve seen SOOOOOO many palettes that look exactly like this before, am I right? 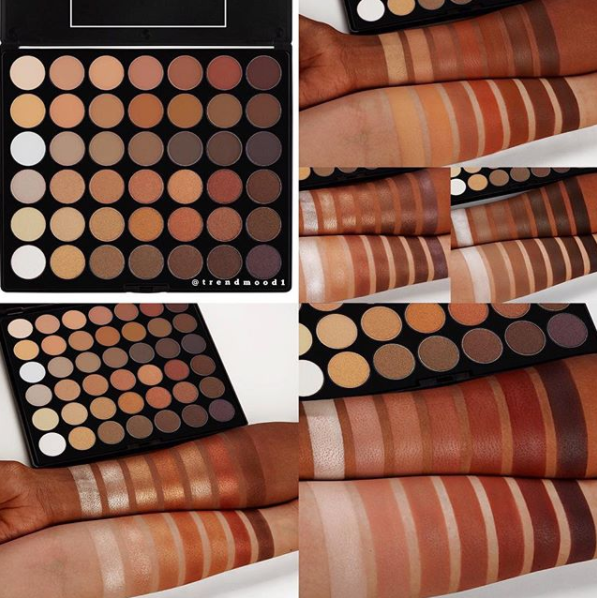 TBH, we are totally getting Morphe 35O vibes – true or true?? However, this one is an even better deal than that one – more shades for less cash, ummmmm YES. BH has amazing quality shadows (I have a TON of their palettes) and the prices can seriously not be beat. If you are a little late to the game (like BH is, no offense) you might have gotten luckier than the rest of us because you get to scoop up literally every warm shade you could ever need in one palette for less than $20! This would be all that you need to beef up your selection of warm tones and be totally on trend! If you already have a bunch of warm shades in your stash, this is probably something you can skip out on, though.